A Globe-commissioned world premiere from the celebrated writer of The Last Match. Esther and Schmuli are shy young Orthodox Jews embarking on an arranged marriage, despite barely knowing each other. Abe and Julia are high-profile celebrities embarking on a dangerously flirtatious correspondence, despite being married to other people. On the surface, the lives of these two couples couldn’t be more different. But Anna Ziegler’s funny, insightful, and mysterious new drama explores the hidden connections between seemingly disparate people, drawing audiences into an intriguing puzzle and a deeply sympathetic look at modern love. Return to the splendor of the Jazz Age and the frivolity of the Roaring Twenties with F. Scott Fitzgerald’s passionate, thought-provoking, and complex The Great Gatsby. Edward Elgar’s final significant composition is at the heart of this program, a cornucopia of orchestral colors and national textures. Rising young Romanian cellist Andrei Ioniţă performs Elgar’s by turns confident and darkly introspective masterpiece, a reflection of the composer’s extreme ambivalence about an England forever altered by war. The program is rounded out by a neglected but brilliant French impressionist ballet score by Claude Debussy, an orchestral concerto of Hungarian themes by Zoltán Kodaly and a blazing rhapsody of Romanian music by George Enesco. The La Jolla Concours d’Elegance features various types of fine automobile gems. Past years have showcased horseless carriages, Italian marques, British marques, woodies, 50s classics, American sports cars (with a salute to GM on their 100th anniversary), and the automobiles of Carroll Shelby. 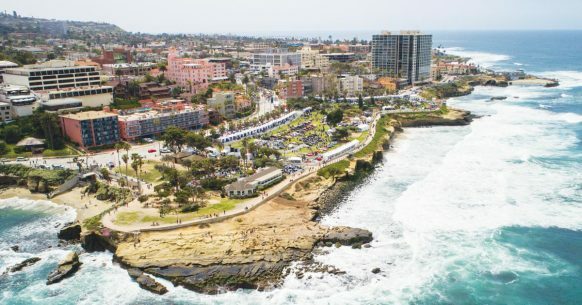 Spectators from all over the nation come to the breathtaking shores of La Jolla to view their favorite classics. Maritime Museum of San Diego, home to one of the world’s largest collections of historic vessels from sail to steam to submarine, will sail California’s official tall ship Californian on San Diego Bay for the 30th Annual America’s Schooner Cup Charity Regatta Saturday, April 7 to support Navy-Marine Corps Relief Society (NMCRS), a Navy sponsored 501c (3) public nonprofit organization that exists to help meet the emergent financial needs of active duty and retired Sailors, Marines, and their families. Come have a Zoo-per fun time with family and friends at The Living Coast! Ever wonder how zoos got their start? How about what makes them so important to plants and animals? Find out all of this and more while listening to talks, doing crafts and getting up close and personal with some amazing animals that call zoos home. This entry was posted in San Diego Events and tagged county, planning by Brent Bernasconi. Bookmark the permalink.